Russian Hebrew writer; born at Wilke July 25, 1839; died at Vienna Feb. 2, 1897. Having acquired a reputation as a good Hebrew writer at home, he removed to Vienna, where he followed the profession of a publicist until his death. Kaplan was the author of the following works: "Mistere ha-Yehudim" (Warsaw, 1865), a Hebrew translation of the first volume of the historical novel "Die Geheimnisse der Juden" of Hermann Reckendorf; "Ḥayye Abraham Mapu" (Vienna, 1870), a biography of the Hebrew writer Abraham Mapu, with two appendixes containing "Mosheh 'Immanu," a poem in praise of Moses Montefiore, and "Se'u Zimrah," a hymn in honor of the choral society Ḳol Zimrah of Cracow; "Ẓarah we-Neḥamah" (ib. 1872), a Hebrew adaptation from the German novel "Die Falsche Beschuldigung" by L. Weisel (ib. 1872); "Dibre Yeme ha-Yehudim" (ib. 1875), a Hebrew translation of the third volume of Grätz's "Gesch. der Juden" (ib. 1875); "Kelimah we-Belimah" (ib. 1882), two satirical poems; "Mosheh Mosheh" (ib. 1884), poem on the celebration of the centenary of Moses Montefiore; and "Ha-Shemesh" (Cracow, 1889), reflections on the sun, its nature and substance. Kaplan frequently contributed to the Hebrew periodicals, and was involved in press polemics on the merit of the works of Smolenskin, which he defended against their critics. 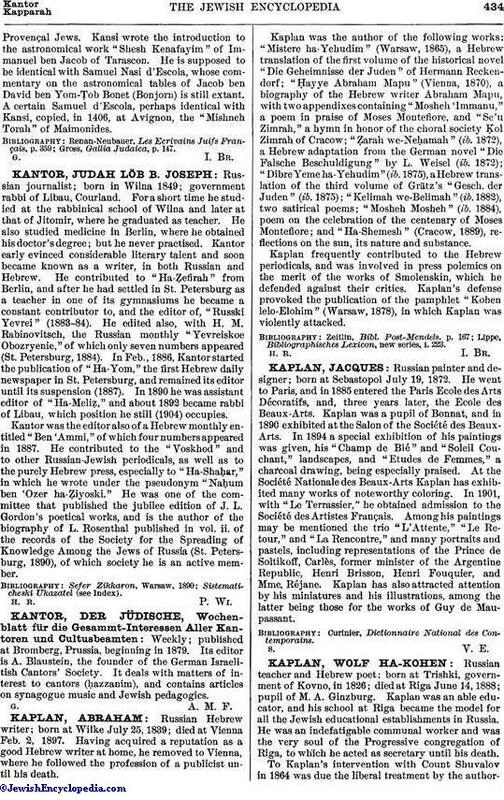 Kaplan's defense provoked the publication of the pamphlet "Kohen lelo-Elohim" (Warsaw, 1878), in which Kaplan was violently attacked. Lippe, Bibliographisches Lexicon, new series, i. 223.